This mission style china hutch is pictured here in brown maple with Asbury stain. Pictured in rustic cherry with Asbury stain. To showcase your most delicate collectibles, the Alvada Hutch is uniquely framed by glass doors. Few other hutch designs feature glass display doors on the ends of the buffet and running all the way up the sides of the hutch, in addition to the hutch doors in the center. The extra glass lets the Alvada display large or complimentary collections. To ensure the Alvada is built to last, Amish craftspeople select American-harvested wood to create your dream hutch in the USA. This heirloom hutch is a luxury that will be a hallmark of your home and beloved for generations. The Artesa Sideboard complements the Hutch with beautiful crown accents and pieced side design. Bottom sliding doors are a unique feature that creates convenience as well as a simply modern feel. Incredibly detailed with beautiful crown accents and pieced side design, the Artesa hutch creates a modern feel. The open/closed top features the same accent design as the top and bottom side panels. The solid construction and impeccable detail of The Aspen Bar Stool will be second to no other piece of heirloom furniture on the market. The Aspen Bar Stool is elegantly Mission styled and will look great with any shaker or mission styled leg or trestle tables. For a Mission chair that is as sturdy and functional as it is classic, the Bayhill Bar Stool features straight lines and a handle in the end cap. The Bayport Hutch has an elegant design that will fit into nearly any other design scheme. With four glass doors in the hutch, four buffet drawers and two opposing cupboard doors, the Bayport exemplifies symmetry. While classic in design, its minimalism makes it compatible with contemporary environments. Simple Mission lines give the Bayport elegance that you can do nearly anything with. 100% solid hardwood is always in style. The Bayport Hutch is made in the USA by Amish craftspeople who follow the strictest quality standards: pride in their work. The Bayport is a hutch that the next generation will be glad to use not only for its durability, but for its versatile style. Pictured in brown maple with Acres stain. For more storage space and decor in your kitchen, the Bayport Island Buffet has a beautiful minimal style that fits in any classic, modern or contemporary space. You may even customize it for an elegant rustic look. This buffet has a geometric design. The ends protrude slightly as your eye moves downward on the side with the cupboards and drawers. Likewise, the top is useful and large, extending from the back. Five central drawers and two opposing side cupboard doors make the face of the Bayport easy to look at. Solid hardwood, Amish building techniques and elegant style create a kitchen buffet that you will enjoy for decades. This piece is pictured in a custom finish with two kinds of wood, a combination of paint and stain and a worn look; these custom finishes add to the price shown to the right. The photo is with a rustic cherry top with Malaguania stain plus a glaze; the cabinet is shown in brown maple with Black paint with Mike's rub through to make the edges look worn. 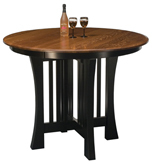 The standard finish is for the piece to be built in one kind of wood with a normal stain. The Beckley Bar Stool is contoured just enough to bring added comfort to an elegant kitchen or bar. The Bellingham chair is a beautiful example of Amish Shaker style furniture. With the Shaker style’s parallel slats in the backrest and simple design, his chair is a perfect complement to your dining room. The solid wood and Amish construction ensure that this chair will be a fixture in your home for many years to come. Dimensions: 18"w x 16 ¾"d x 19 ¼"h bk. ht. Height - 24" or 30"
Pictured in pine with Black (Sand-Thru) paint body and Michael's Cherry stained back.